Heathkit it still the King ...... for now! This month's poll on my Website posed the question: "Which of the following kit types have you built?" I was a prolific Heathkit builder; and in fact towards the latter part of their existence, I qualified for inclusion into their "Master Kit Builder" program or whatever it was called. I not only built a ton of Amateur Radio gear; but most of my sound system was Heathkit product, also. I think I had my own personal UPS truck route between Benton Harbor and my house back in the day! This is how the voting rounded out, with 73 votes having been cast. I guess this was a popular topic! Elecraft (11 votes) for 15.07% of the poll. Small Wonder Labs (8 votes) for 10.96% percent of the poll. Emtech (3 votes) for 4.11% of the poll. Oak Hills Research (9 votes) for 12.33% of the poll. Wilderness Radio (3 votes) for 4.11% of the poll. Steve Weber KJ1DV kits (5 votes) for 6.85% of the poll. Ten Tec (6 votes) for 8.22% of the poll. Kanga Kits (3 votes) for 4.11% of the poll. "Other" (9 votes) for 12.33% of the poll. So Heathkit, Elecraft, Oak Hills Research and Small Wonder Labs were the top four vote getters and between the four of them, they accounted for 60.28% (over half and almost 2/3 !) of the poll. Personally, I have built Heathkit, Elecraft, Small Wonder Labs, Emtech, Oak Hills Research and Steve Weber kits - currently working (very slowly) on an ATS-3. It's good to see such an interest in QRP and such an interest in kit building. Now I have to think of a topic for February ..... hmmmmmmm. Check my Website tonight for a new vote! Ever since I earned my Amateur Radio license, I have always subscribed to three periodicals. From the very beginning, I have always received QST, CQ and WorldRadio. For a time I was also a subscriber to 73 magazine; but I kind of gave that up when I just couldn't take Wayne Green's conspiracy theories anymore. From the get go, WorldRadio was always my favorite followed by QST and then CQ. CQ was always a journal devoted to contesting; or so it seemed to me. WorldRadio had all the neat "here is what Amateur Radio is doing for the world" type of stories; while QST was always the flashiest. CQ was CQ and I think I used to get it just to get it. Over the years, my tastes have changed and perhaps, the magazines also. My favorites now are CQ and still WorldRadio. WorldRadio is a friendly constant. I know I am going to enjoy each issue and I always have a good time reading it. CQ Magazine has changed a lot in my mind; or maybe I have. I'm still not pulled to the contesting content so much; but there is so much more in CQ than there ever was before (at least in my humble opinion). I love the editorials by Rich Moseson W2VU. Rich is clearly a common sense kind of guy. I may not always agree with his point of view; but once you've read a few of his editorials, it's clear that he has the best interests of Amateur Radio at heart. And perhaps even more importantly, it is obvious that he still loves and is passionate about the hobby. CQ also has one writer who I hope never moves on or goes away. Dave Ingram K4TWJ is perhaps the best part of CQ magazine. 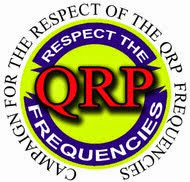 He covers various topics ..... QRP, CW (you can tell why he's my favorite! ), new products and other special features. From his articles, you'd have to be totally unaware to fail to miss how much he loves Ham radio. His articles are always entertaining, educational and his enthusiasm is infectious. I've had the opportunity to talk with Dave a few times on the air and a couple of times on the telephone. He is one of the most gracious and sincere gentlemen that you could ever want to meet. QST is QST. It has some good stuff in there from time to time; but it just doesn't pull me like it used to. I get it every month without fail as a Lifetime Member of the ARRL (I'll go into my feelings on THAT in a future post). Most of it is over my head; but every now and then they have a construction article that I can sink my teeth into. But when I come home from work and look at the mail on the dining room table; and I see that the new issue of WorldRadio or CQ has come ....... now THAT makes my day! It's a link to a Dilbert cartoon video. I think you'll enjoy it if you don't get annoyed by the association of Ham Radio operators to geeks. One of the hazards of loving a technical hobby that most folks don't understand. No way I could do this! The following link appeared on QRP-L today, courtesy of Charles, W3KC. I love antennas just as much as the next Ham; and I realize that this is a commercial installation; but there is NO WAY that I could do this! I really have to respect the guys who can, though. Even though it's a commercial for Coca-Cola .... enjoy the visuals! What got to me was the footage of the birds flying! Maybe I'm just in a dour mood. The Report and Order by the FCC removing the requirement for a Morse Code examination in order to allow an Amateur Radio operator to operate below 30 MHz was published in the Federal Register the other day. 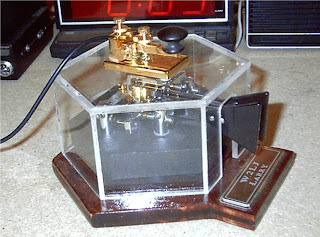 Thus, 30 days later on February 23, 2007 the long standing tradition that Ham radio operators must know Morse Code to get on the HF bands will be history. I question the wisdom of this action. I question the wisdom of any action where standards are lowered and tradition is chucked out the window in favor of expedience. I fear we will suffer from the consequences of this some day, perhaps sooner than later. But the Genie is out of the bottle and I doubt anything will ever be done to stuff it back in and reinsert the cork. What boils my onions is that the ARRL is so damned happy about it! On their Website, in the pages of QST, in the ARRL bulletins there is, in my opinion, a underlying level of giddiness akin to a youngster finding presents under the tree on Christmas morning. This is sad. The motives for the League's position on the issue were always suspect to me. Now, the harsh light of daylight is showing them for what they truly were. It was never about the "advancement" of Amateur Radio; it always about the money. Somewhere I read of their breathless announcement of how on the day the R&O was released they had 500 inquiries on how to become acquire an Amateur Radio license. Wow ...... 500 more opportunities to sell license manuals, CDs, books, etc. The old advice of "follow the money" never seemed truer than it turned out to be in this case. I doubt that the elimination of the Code will mean a long term and dramatic increase in the number of Amateur Radio licensees. There will probably be a short term increase; but I doubt it will be the sustained growth spurt that the League touts as their reason for wanting the elimination of the Code requirement. All the doom-sayers who have Amateur Radio dead and buried think that the Code was an obstacle to the growth of the hobby. I think that's just a bunch of hooey; just another urban myth that took on a life of its own. Amateur Radio numbers are just about as high as they've ever been. Just because the influx of new Hams tends to be from an older demographic doesn't necessarily mean the end days of the service. Furthermore, if it is truly the "Amateur Radio Service" then I think the attitude and focus should be on quality and not quantity. An Amateur Radio license should not be regarded as a birthright. It is a privilege earned by study, hard work, desire and discipline. One of my bosses once warned me that when a customer receives something for free, then that item or service no longer has any value. It's not something that was end result of work; it becomes a trinket that was just freely given and loses whatever intrinsic value it once had held. The bottom line seems to me to be that the FCC is just doing whatever they can to make the Amateur Radio service less work for them; and that ARRL is doing its part to make the Amateur Radio service into a moneymaker for them. After "Monk", I settled in for a few QSOs. One was of particular interest. Bob K8CCG answered my CQ on 80 Meters, right in the vicinity of the QRP "watering hole" of 3.560 MHz. Bob lives in Muskegon, Michigan and he was using a home brewed transmitter. Bob was putting out 500 mW (1/2 a Watt) to a dipole. He had a very good 569 signal into New Jersey which actually peaked up at 589 when the QSB would go away. Bob had a very tiny bit of chirp on his signal which was not objectionable at all; but still was not a perfect tone note. I'm definitely no radio Einstein; but I think that Bob was suffering from some kind of parasitic oscillations in the oscillator section of his transmitter. He was monitoring his own signal; so he actually informed me about them. I hear guys like Bob, putting their own home designed and built equipment on the air; and I just give out a heavy sigh! I wish I was talented and knowledgeable to do stuff like that. Maybe this year I should concentrate on building a few simple items from scratch instead of concentrating on kits. I do have a Tuna Tin 2 to build; and I ordered all the parts I need from Mouser to homebrew a 40 Meter receiver. Not my own design; but it will be my own construction from scratch. I guess everybody's got to start somewhere ..... right? There was a pleasant surprise in today's e-mail. The latest issue of the e-zine, "The K9YA Telegraph" was witing for me in my e-mail inbox. "The K9YA Telegraph" is written for Amateur Radio ops who happen to be aficionados of Morse Code and CW. The publication, which comes out monthly, has a whole slew of articles written about interesting topics that relate to Ham Radio and CW. Best of all, it's free! How can you beat that? This month's issue includes articles about veteran Amateur Radio ops memories about operating during the Cold War in an article fittingly entitled "Cold War Tales"; as well as a great article about straight keys called "The Black Bouncer". Each issue contains about 3 or 4 subjects and I guarantee that you are in for a good read! and subscribe today. You have nothing to lose and everything to gain! You can even print out copies of the issues in case you have a burning need to take them into "The Library" with you! Tonight was the beginning of the second half of the Foxhunt season. I shared 80 Meter duty with Randy K7TQ. It was a strange night. As the Foxhunts start at 9:00 PM local time, here in New Jersey, I went down to the shack to turn everything on and get everything going with about 20 minutes to go. 80 Meters was nice and quiet. A faint hiss was all the background noise I was getting, which was leading me to think that it was going to be a great night. With 10 minutes to go - same thing. I'm getting real confident now. At this point, I came upstairs to bring a glass of water with me to sip on during the Foxhunt. I picked up the headphones, plop them on my head to just to hear an S5 background noise level! What happened! In just a few minutes, 80 Meters went from sublime to a wreck! I called "CQ Fox" and was greeted by nothing but noise. That I didn't hear my first Hound until four minutes into the hunt was not a good omen. It turned out that the entire 90 minutes became a struggle between me and the QRN. It was not the fun night that I hoped it would be; and I was doubly disappointed as I did not exceed my QSO total from the first hunt. That was my goal. I used every trick in the arsenal to pull out signals from the noise. That I worked 34 stations in the 90 minutes is probably very good under the circumstances. However, I expected more out of myself and am a bit disappointed. Sometimes, I'm my own worst enemy. Everyday, I read John Shannon's (K3WWP) "diary" or blog with intetrest. I noticed that in the entry for January 21st, he writes about corresponding with a Ham who seems to have no luck whatsoever with QRP. I always kind of marvel at that, now. I can understand it though, because when I was first getting into QRP I also found it hard to wean off the dependency of 100 Watts. But as you make more and more QRP QSOs, you realize that it's not so much the Watts; but what it is that you do with the Watts you have. While 5 Watts to a bedspring might cut it during a sunspot maximum, it's definitely not going to during a sunspot minimum. A decent antenna makes life easier. It doesn't have to be a monoband Yagi at 100 feet! Regular ol' vanilla wire antennas do a great job. Even attic antennas for those who are covenant restricted will do a decent job with a bit more patience. But I think one of the major factors is that QRP is a mindset. If you have it in your brain that you will make QSOs, you will! One should not try QRP expecting to fail. If you think you're going to fail; then you will get easily frustrated and you most undoubtedly will. The most successful QRPers are the ones who know their equipment inside and out. They know how to use it to its full advantage. They understand propagation (even if it's only the basics) and they use that knowledge to their advantage. They have patience and skill; but most of all they know that 5 Watts is not a serious handicap or limit and they operate that way. And boy, do they have the QSO tallies and contest awards and operating awards to show for it! 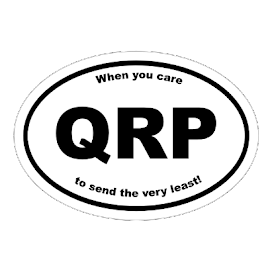 QRP is not for everybody, especially those who are totally dependent on instant gratification. But if you put your mind to it; I think you'll be quite surprised with the results you get. Watching the 10:00 PM News, I see where the State of New Jersey is stepping into the public schools and will remove all "junk food" from any vending machines present in the school buildings. You can't have M&Ms or potato chips with your lunch; but you can get an abortion without your parents ever finding out. In this state, if you have a headache in school, the nurse is not allowed to give you an aspirin without your parent's permission; but you can walk into the principal's office and get free condoms. Is this state totally screwed up, or what? It seems the only section of the country that was getting Winter was the Rockies and Plains with the serious snows that they have been getting. Winter here in the NorthEast has been more like Spring! Christmas felt more like Easter and most of January felt like March or April. That was until a few days ago. As I sit here typing this, my indoor/outdoor thermometer is letting me know that it's only 19 degrees outside. However, if you dare go outside, it feel more like zero; or below. The wind is bad; and the wind chill effect is dramatic. We have been fortunate to have such good weather so far. It has been so much warmer than normal. However, after experiencing that, these normal or even slightly below normal temperatures feel a ton worse than they would any other year! I am constantly trying to stay warm. I have layers on and am for the most part, pretty comfortable. But my hands are another story. Trying to keep them warm is a battle. And sending code is just a bit of a struggle when the digits are not toasty warm. We keep the house at 66 or 67 degrees. The shack, which is in the basement is at about 63 or 64 degrees. I can't stay down there too long in weather like this without coming upstairs for frequent warm-up breaks. Last summer, I bought a used Dell Inspiron laptop from where I work. The intention was to upgrade my laptop situation in the shack. I have been using an old Toshiba Satellite laptop; which I had also bought used, for a song. While the price was minimal, I was reminded that you get what you pay for. I should have known I was in for a less than optimum experience as the previous owner had a sticker of a picture of a snail stuck on the top half of the computer, near the screen. Shortly after I purchased the Toshiba, the sound card failed so I couldn't even use the computer for the digital modes. The Dell was a step up; but I screwed it up totally, right after buying it. I thought I had turned the computer off and I folded it up and put it in it's case, to bring it home. When I got it home, I realized that the computer had been left on and it was very, very, very hot! Trying to turn it back on again yielded nothing. I must had damaged the power connection on the motherboard as the computer wouldn't even run off the AC adapter. This was definitely a Homer Simpson moment. A few weeks ago, I put the computer on eBay for parts; and I sold it "as is". I got a goodly amount for it, much to my surprise. In turn, I scoured eBay and bought a Dell Latitude, which is a lesser model. I ended up getting it for about 10 bucks less than what I sold the Inspiron for. It's not as fancy as the Inspiron; but it works and it has a working sound card. Now one of these days, when I actually get some time, I will load up Spectrogram and will finally really nail the alignment of my K2's filters. The computer has a 10 Gigabyte hard drive. It's running Windows 2000, which has chewed up a large chunk of that hard drive; but there is more than 5 Gigabytes left. For the few Amateur Radio programs that I will be putting on there, that's more than enough space. It came with a detachable floppy and a CD ROM drive. All in all, it's a good little laptop and will serve my purposes well. Tonight was the monthly North American QRP CW Club (NAQCC) Sprint. Band conditions seemed to be excellent! 40 Meters was quiet with only very small amounts of local noise. 80 Meters was even better. So why did I manage only 28 QSOs in the two hours? I just couldn't seem to get into a groove. At least twice, I started running a frequency, only to have another station stomp all over me and take over said frequency. Hey, doesn't anyone listen or send a "QRL?" before they put hand to key, anymore ???? I thought that most members of the NAQCC were of the highest caliber; but sadly I am becoming disappointed. I realize that folks get caught up in the moment of competition; but that's no reason to stop extending common courtesy. In any event, the whole evening seemed out of kilter after that. I never got a good rhythm going and ended up wasting too much time "searching and pouncing" or looking for a clear frequency. I know, sounds like whiney excuse making; but that's just the way it was. Maybe next month will be better. Saturday January 6th was the Twelfth Day of Christmas. Since I've grown up, this day which is the Feast of the Epiphany, is also known as "Little Christmas". This is the day Christians celebrate the visit of the Magi to the manger in Bethlehem. In many eastern Christian cultures, THIS is the day for celebration and gift giving. It was an appropriate day, then, that the USPS delivered my LTA SKCC straight key from Morse Express in Denver, CO. This was the straight key that my wife Marianne had given to me as a Christmas gift. It is a beautiful key! Since I already own an LTA Cootie key, I had an idea of what the quality of this key would be even before it arrived. I was not disappointed. The construction is beautiful; and the 18K gold plating makes this instrument shine. But this key has what it takes beyond good looks. I was able to adjust it to my preferred settings quite easily. I like the contact gap to be just a titch wider than the thickness of a few pieces of paper. I get a more positive sense of key closure this way, without it being so wide that using the key becomes tiresome. Same thing goes for spring tension. I like the key to be tensioned so that the key opens very easily; but at the same time, it doesn't take me a whole lot of effort to close the contact. That would make for choppy dits and is unacceptable to me. The bottom line is the key looks wonderful and operates the same way. There is a distinct but gentle "clackiness" in using the key that is pleasant and doesn't become bothersome. The engraving of the Staright Key Century Club logo on the key's arm was done quite well. Mine also has the engraved serial number "33", meaning it was the 33rd key maunfactured in however long the SKCC series lasts. Ward Silver, NØAX writes the ARRL's "Contest Rate Sheet". Ward has been so very helpful to me in aiding me to get the word out about "Runs For the Bacon" and the NAQCC Monthly Sprints. This eloquent essay on Morse Code, by Ward, appeared on the Straght Key Century Club e-mail reflector, earlier today. Regarding the end of CW testing and the future of CW on the airwaves, I thought this statement from Paul W9AC was worth consideration, "An artist does not stop painting because cameras can more accurately capture an image." Nor does a fly fisherman stop fishing because there are fish in the store or a sailor scrap his sailboat because a power cruiser can go faster. Morse will be a part of ham radio for a long time, as long as someone wants to use it. Well, as long as TWO people want to use it. The question is whether it will drift off into obscurity or stay healthy. For inspiration, we can look to RTTY - the fastest growing contest mode of all! Who would have thought ten years ago that would be the case today? RTTY required an external gadget, cables everywhere, strange filtering, and so forth. Today, with a simple audio interface, a computer sound card, and free or cheap software, anybody can get on RTTY. Wow! Looked at the RTTY contest scores lately? In the CW universe, high-speed Morse competition based on RUFZ and other programs is attracting some good young operators. The speeds are ridiculous - 200 wpm has been reached - and I don't expect to hear dots and dashes flying by quite that fast on 40 meters. In fact, I can't hear dots and dashes AT ALL at 200 wpm. It's like bar code! Nevertheless, there is plenty of interest to be tapped. That's where you come in, of course. Lift that chin up and let's see if we can't actually make a compelling story out of Morse on the airwaves. I can say for sure that we won't convince a single person to take it up by loudly claiming that the hobby is all "dumbed down." When a prospective customer hears that sort of talk, the chances are pretty good that they'll just keep their money in their pocket as they walk on down the street. Bravo, Ward - from your "pen" to God's ear! A California radio amateur played a part in an international effort to rescue a US sailor attempting to single-handedly circumnavigate the globe. Miguel ''Mike'' Morales, KC6CYK, of Riverside, told ARRL he was able to contact fellow radio amateurs in Chile to obtain and relay reassuring information to the family of Ken Barnes, whose 44-foot ketch Pivateer was foundering off South America. A Chilean trawler, Polar Pesca 1, rescued Barnes from his disabled vessel on January 5. Upon learning of Barnes's predicament on January 2, Morales said he contacted the sailor's fiance, Cathy Chambers. Morales speaks fluent Spanish and has visited Chile and knew ''the way things operate down there.'' As a result, he says, he was able to obtain credible reports via his 10-meter contacts as to what was happening. Morales said he was able to gather information via his Chilean ham radio contacts from the Polar Pesca 1. He relayed information about Barnes's location and when he was going to be rescued. Morales said he felt it was important for the family to know Barnes's situation and how the rescue plans were playing out. Barnes, who's 47, left Long Beach, California, late last October, hoping to be the first person to sail around the world from the West Coast. A severe storm dismasted, badly damaged the vessel and soaked his supplies. The Chilean Navy dispatched one of the CP3 Orion aircraft Chile uses to patrol its 200-mile-offshore territorial claim. The plane spotted the foundering vessel, photographed it and even attempted to drop a life raft that missed its mark. The Chilean Navy coordinated the operation and recruited the Polar Pesca 1 to undertake the actual rescue, although Morales says the US Coast Guard agreed to cover the expense. At that point he was able to pass along news to the family that the trawler was en route to Barnes's location. Barnes is scheduled to return home to California this week, and Morales will be among those on hand to welcome him. This is just one instance out of thousands in Amateur Radio's long history, where life and limb have been saved due to the efforts of "Joe Ham". It makes you pround to be an Amateur Radio op. Well, even if the ARRL and the FCC have given up on Morse Code, it seems the National Security Agency hasn't. At their Website, they have a game featured to get the youngsters excited about learning Morse Code. will get you there. Click on "Operation Dit-Dah" when it comes up near the bottom of the screen. I had a good time with it; and oft times I've been accused of being "just a big kid"; so if this big kid liked it, your little ones should, too. Thanks, NSA! It's nice to see that the "grown-ups" are still behind the scenes taking care of things. The FCC and the ARRL would do good to start taking notes! I was out in my backyard working out the bugs in QRP portable setup. There was a table on my patio that I setup my station on. Then I tossed my combo 20 meter half wave, 40 meter 1/4 wave up in the tree and sat down at the table. Turned on the K1, tuned up the antenna on 20 meters and listened around for QRP stations. Nothing on as it was pretty late in the afternoon. Tuned up the antenna on 40 and then over to 7.040 I went. Heard a loud station and called him when he finished his QSO. We had a nice chat and wished each other a Happy New Year. That's when the beauty of CW hit me. I had been working a lot of digital and even posted here that digital would eventually dominate CW. However there is going to be something lost when that happens. Something about those CW signals on the air. Having to actually listen to them and copy down what is sent. Sending back with a keyer in response. Working them through the noise and QSB at times. Out on a patio, woods, a park or at a home station I have thoroughly enjoyed working those stations. Not just clicking on a signal on a computer screen in total silence. So while I still think wide scale use of CW will come to an end some day. It will be a sad day when that happens. Jeff, I agree with most of your post. I enjoyed reading of your appreciation for the mode. I disagree, however, that CW will ever disappear. On that matter, Paul W9AC posted this today, in answer to Jeff's post: "An artist does not stop painting because cameras can more accurately capture an image. " And I totally agree! Maybe while not in the majority, there will always be people who like to tie their own fishing flies, fabricate their own musical instruments, restore and use classic cars. There is a romance and magic to CW that will not let it disappear, will never let it die. There will always be people engaging in activities just because they are a little more difficult or a little more unique, or a little "different", or perhaps just darned more enjoyable! nominations for election to the QRP-ARCI ‘QRP Hall of Fame’. 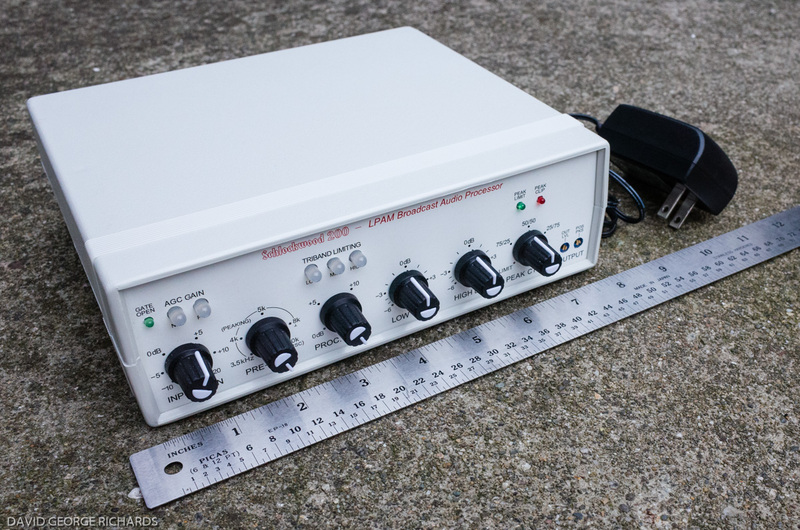 First off, before I go off on a rant here; let me state for the record that I really, really like the QRP-ARCI. I have a relatively low membership number (4488) and I joined up when the organization was dedicated to keeping output power at 100 Watts or less. That was a long time ago. 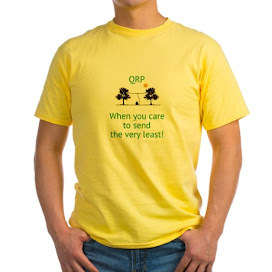 An overhwelming number of people that I have met via the QRP-ARCI are some of the nicest people I have ever known. I will continue to be a member; but with that all said ....... as far as the above announcement goes ........ I say "Harumpffffffff !!!!" A while back I nominated someone for the QRP-ARCI QRP Hall of Fame. And a friend, unbenownst to me, nominated another. Well, we found out about it and seconded each other's nomination. I won't divulge the name of the nominees; but let me say this, if you've been into QRP for any significant amount of time, you will instantly recognize the names of the two folks we nominated. We felt and continue to feel that both these folks have done a lot for the QRP community and the QRP art; and that they are both very deserving of being HOF members. Neither one was selected. Okay, I know, it sounds like "sour grapes"; but really it isn't. I was somewhat disappointed that neither got in; but was ready to move on and forget about it for then. What upset me was a private e-mail that I received from a QRP "insider", shall we say. Again, I will not divulge who this "insider" is. That secret will go with me to the grave; but again, if you're into QRP for any significant amount of time, you would know who this was instantaneously. Basically, I had "The Facts of Life" explained to me. I was informed that the selection process was not solely based on merit; but as usual, is somewhat political, too. Merit is not all that it takes. Among other considerations, appearances at the major QRP confabs; such as FDIM, or Atlanticon, Pacificon, Lobstercon, Ozarkcon, etc. are also taken into account. That alone floored me! What does appearing at QRP conventions have to do with being a member of the QRP Hall of Fame? I would think the accumulated body of work should be enough! What a person has designed, what services a person has offered, what things a person has taught, how much a person has shared with the rest of the QRP community - THESE are the things that should go into determining the Hall of Fame members! I guess I am just idealistic, simplistic and naive in things like this. I always thought that merit and accomplishments alone should be the qualifier. The other superfluous things just kind of turn it into a clique, as far as I'm concerned. Revelations like this leave one jaded and disappointed. It will probably be a long, long time before I ever consider nominating a person for the QRP Hall of Fame again. Now, before I close, I want to state emphatically that there is NOT one single, solitairy person that is currently in the Hall of Fame that doesn't belong there, in my opinion. Everyone who has been selected is most deserving of the honor. It's just my humble opinion that there are other deserving people who also belong; and are not being considered perhaps for the wrong reasons. As always, I had a ton of fun on Straight Key Night. It was so good to hear so many signals that one actually had to go looking for a clear frequency! I wish it could be like that all the time. One would think that if so many folks had such a good time then they would want that to carry on throughout the year, no? I ended up with 6 QSOs for the event. They were all nice. The folks that I worked were Jim N3JV, Hank K8DD, JIm WG1L, Mike W4KAV, Lynn WA2DAC, Keith K1Y/1. I tried to say on and linger in each QSO as long as I could. Some folks wanted to hang around longer than others; but all the contacts were good No shorty "599 TU" types of contacts, which was great! I finally left the airwaves when my wife got home from work. Spending time with her to see the New Year in at Midnight was my A#1 top priority. I used the 2006 Christmas Key from Morse Express that my lovely wife got for me for Christmas. I have a picture posted because I want to give you all a frame of reference for how really small this key is. Yes, that is it sitting on top of the cover of my Elecraft Hex Key. However, as tiny as it is, it is a trooper! It's designed in a way so that as you "pound" this piece of brass (actually it's gold plated), you are concentrating your effort right onto the center of gravity. The benefit of that is that there is absolutley no wandering or wabbling of the key around on the operating surface. I sent for over two hours with this key on New Year's Eve without any pain or fatigue. Maybe that's just the technique I use for sending; but I think the quality of this little gem had something to do with that. I actually like the action on the 2006 key better than the 2005 key; but from now on, when my wife asks me what I want for Christmas, I'll have a ready answer for her. These small straight keys by LTA in Spain are the best! My SKN report will be heading into the League soon. I will be getting a soapbox report in tonight or tomorrow on the ARRL Website. I really hope they get avalanched by SKN reports this year! All you FISTS, NAQCCers and SKCCers - get your reports in and more importantly, your Soapbox comments uploaded! The ones that are already up are excellent; but we need a ton more. Even if you only made one QSO, don't be embarassed - let the world know about it!